Walk to Lake w/View, Pool Table, Prof. Arcade Game, Hot Tub, and Pet Friendly! Here's a big bear vacation cabin that is sure to please many travelers looking for a rental cabin in big bear offering a sportsman's ambiance. From the moment you pull up to the cabins entrance, Elk Lodge's ambiance is the essence of mountain life style with adventure. Upon entering this mountain cabin, the vaulted knotty pine ceiling adds to the openly spacious feeling. Wood paneled walls abound and add to the ambiance and charm that is reminiscent within vintage cabins in big bear. With nature's trophies throughout the home, this big bear cabin is the epitome of the lifestyle of a sportsman's adventures. As your big bear vacation begins, guests can enjoy the lake view from this wonderful cabin in big bear due to its close proximity to the beautiful waters of Big Bear Lake. The living room offers an exceptionally large sectional sofa as well as a new flat screen TV complete with VCR and DVD. The opposite side of the cabins great room offers a pool table as well as a beautiful brick wood burning fireplace. Although you are in the San Bernardino mountains, guests wanting to stay connected to friends or business can do so with the wireless internet provided within the cabin. A newly remodeled kitchen is fully equipped and ready to serve a hearty mountain meal whether it's cooked on the stove, in the oven, or on the outdoor barbecue. Complementing the cabins level above, the "lure" of the lower level lends itself to guests getting "hooked" on fishing in big bear. A fisherman's paradise abounds throughout the den and main bedroom. No tall tails, just pure comfort and cabin style for all who dwell within. The den is cozy and intimately inviting and offers an additional TV with VCR and DVD, it's the perfect place for young children or young adults to enjoy their own social area. There are three distinctively diverse bedrooms in this big bear rental, each offers comfort for those who reside within. A laundry room is also offered making it convenient for longer stays during any of the seasons throughout the year, especially drying wet clothes from outdoor snow play fun. Just out the back door a staircase leads you to an awesome hot tub that has special lighting effect to further mesmerize guests who wish to indulge. The hot tub at this cabin rental pampers its guests with a lounger as well as traditional seating. With 24 multi custom jets to enjoy, each guest can adjust the intensity to their own preference. Customized lighting is an upgrade to enjoy. Choose from a rainbow of colors, just one at a time or an entire spectrum of colors for your visual pleasure! This cabins hot tub is nestled just steps off the den staircase to the back yard, is semi private with views of majestic pine trees as well as other beautiful landscape, you won't be disappointed. The experience in the hot tub here is a relaxing experience you won't want to miss. The backyard is large and perfect for snow play in the winter. The side of the cabin offers a sloped area for its own snow play hill as long as mother nature has been cooperative. This is one Big Bear vacation that promises to be exceptionally special. 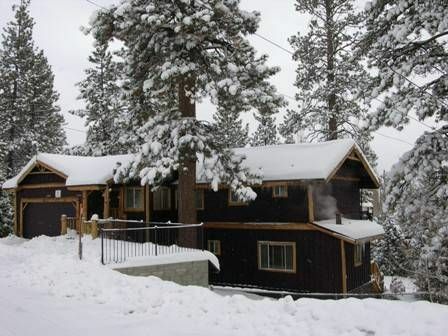 This vacation cabin in Big Bear is located in a quiet neighborhood in Boulder Bay, convenient access to Big Bear Blvd. which leads you to many of Big Bear's most famous tourist attractions and activities. Only steps to Pleasure Point Marina with a boat dock rental option (seasonal), also steps to Boulder Bay Park, the newest park on the lake where visitors can fish from shore, only 2 miles to the shopping village & Pine Knot Marina, 3 miles to Meadow Park - home to the only swim beach in Big Bear, 4 miles to the slopes of Snow Summit Ski Resort, and 5 miles from Bear Mountain Ski Resort & the Moonridge Zoo. Only a mere 6.1 mile drive to the activities offered at the Convention Center - Don't miss the famous Big Bear Oktoberfest, Southern California's biggest German festival! Appreciating all the attributes of seasonal changes that higher elevations allow, we wanted to have our children grow up experiencing these wonderful gifts of nature that they wouldn't know otherwise. Big Bear is the perfect place, only an 1-2 hours drive from Los Angeles. With both of us working intense hours the only time we can getaway is for brief weekend excursions. The brief time spent driving to Big Bear instead of further away destinations gives us maximum time on enjoyment. We can even make it up and back in one day without debating whether to make the trip or not. We chose the area of Boulder Bay in Big Bear since it is known to be a little colder therefore, usually getting more snow than other areas. The street that Elk Lodge is on is unique in that the homes that are across the street are much higher up and it appears that there are no cabins directly across from you. The location is also perfect, right off the main hwy. yet far enough to not hear any noise from traffic, only one street up from the lake and walking distance to Pleasure Point Marina where they rent boats of all sizes and kinds, electric canoes and water boats for kids, you can purchase fishing licenses, bait etc. Just down the street from a very popular spot for kids, Magic Mountain - has huge snow play hill for tubing in the winter, a year round bobsled slide where you ride a gondola to the top of the hill to start, 2 active water slides in the summer, mini golf and a go-cart slick track. Also, just 1 mile from the home to the village where there are shops, bowling, restaurtants, cinemas etc. The ski resorts are a brief 5 minute drive. This area of Big Bear is also known as being a more upscale neighborhood, location, location, location. We love this home, its the perfect mix of modern everyday amenities as well as allowing for the full mountain experience. The way the property itself is laid out lends itself well for children to play in the backyard as well as have a snow play hill of their own during the winter. No need to spend extra money for sledding or tubing in the commercial areas. Convenience to any and all Big Bear activities if you choose to participate. The interior floorplan is great, it's spacious top level allows for lots of guests whether you choose to be outdoors on the deck, inside playing pool, watching TV on the large sectional sofa, or working within the kitchen. The bedrooms are all downstairs as well as a den. The den is perfect for the kids to watch their own TV channels or play their video games. We've also enjoyed having many guests with us, each having their own bed to sleep. We've also enhanced the home with items of interest when all is at home to play, a pool table, a three in one bumper pool/poker/dining table and a nice hot tub. Being close to the lake, it also boasts a lake view that we enjoy from within the home or on the deck when we are relaxing outdoors or BBQing. The cabin itself was plenty of room for myself and all those who stayed. In all we had 9 adults for one of the nights and we all had space to sleep comfortably. There is no air conditioning but the way the house was positioned in the afternoon the sun was not hitting the back and an open back sliding door provided a nice breeze for the upstairs area. The hot tub was a nice addition that we all enjoyed. Also the grill is directly hooked up to the gas so there was no tank to deal with that I could see. Negatives: When we arrived the bottom shower was dripping but that did not affect us enjoying the cabin. Also on the outside deck there are some boards that stick up a little bit making it uneven to walk on. Summary: if you want something modern and fancy this isn't the place for you. This was a perfect place for us to relax and unwind. It had a cabin in the woods feel with the deer heads on the wall and the bear skin on the walls. Property was not clean, lacked simple items. We were so disappointed with this stay. Our family consisted of 12 people/ 4 days, there was only one role or TP in each bathroom, no dish soap, a dead animal smell. We walked down to jacuzzi to find dirty underwear, beer bottles and a moldy top to the jacuzzi. If you have allergies stay clear we found out quickly. The rooms were dusty especially behind the beds. The deck was not safe for may reasons.